As well as vehicle license plates, UTSCH supplies other individually designed documents with a wide range of security features to support reliable identification of vehicles and individuals. The windshield label or "third license plate" is an additional means of identification that complements the traditional license plate. In the form of the ulabel with RFID unit, it also offers completely new possibilities in electronic vehicle identification. ID cards from UTSCH serve as proof of authorisation and registration for drivers and vehicles, helping to uphold legal and security standards. Displaying the same country-specific license number as the two aluminium license plates on the front and rear of the vehicle, a windshield label serves as a "third license plate". Designed in close cooperation with the customer, the windshield label can be enhanced with several security features. A multi-layer structure, holograms, microtext and UV marking are just some of the ways in which manipulation and forgery can be made more difficult. 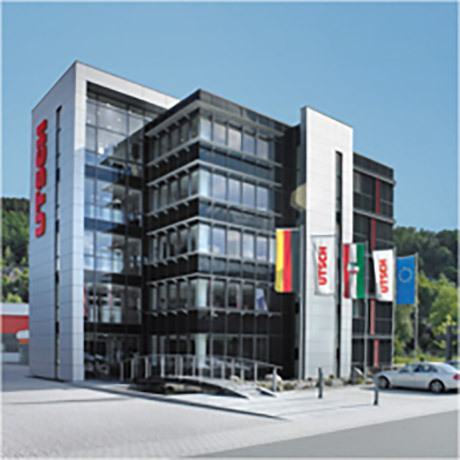 In this way, every windshield label produced by UTSCH is an individual product that reflects the customer's security requirements. The UTSCH ulabel also contains an RFID unit with which vehicles can be electronically identified in moving traffic or with the aid of suitable portable readers. Different chip types and technologies (HF, UHF) are used depending on the customer's requirements. Windshield labels can be personalised by adding vehicle-related data with a thermal transfer or laser printer. 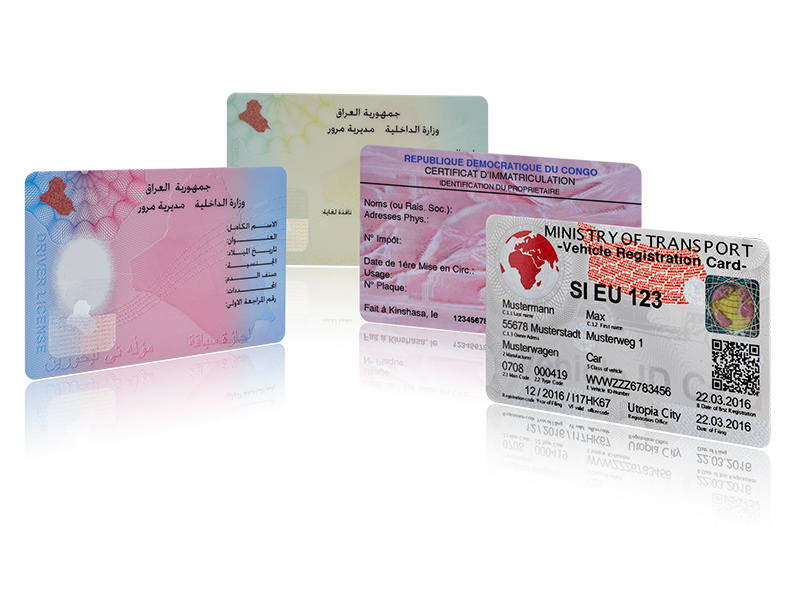 ID cards can serve as proof of registration for a vehicle or as a driving license for a person. 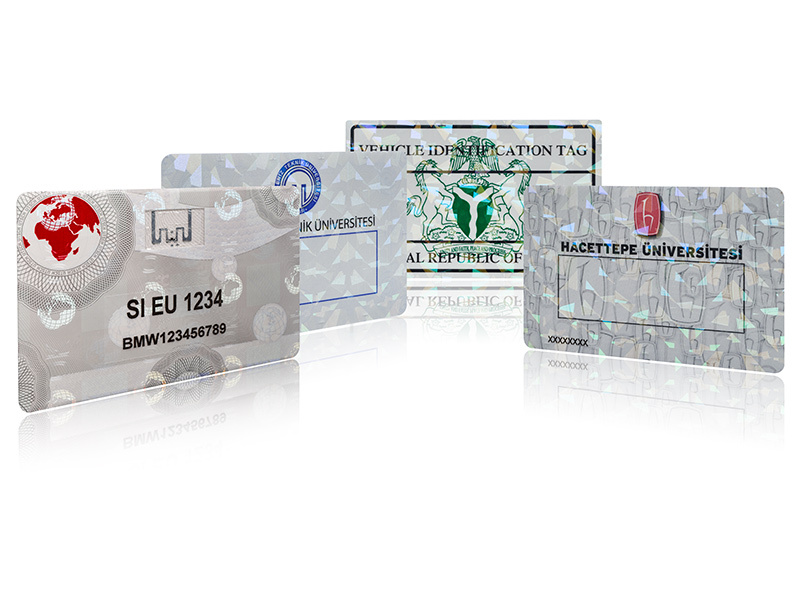 ID cards in credit card format are particularly popular. These sturdy plastic cards, designed in close cooperation with the customer, can also be enhanced with a range of security features. A multi-layer structure, holograms, microtext and UV marking are just some of the ways in which manipulation and forgery can be made more difficult. ID cards can be personalised by adding vehicle-related or personal data with special printing technology or laser personalisation equipment. As well as visually readable information, the ID card can incorporate machine-readable information, for example in a magnetic strip, a barcode or an RFID unit. Different chip types and technologies (HF, UHF) are used depending on the customer's requirements.